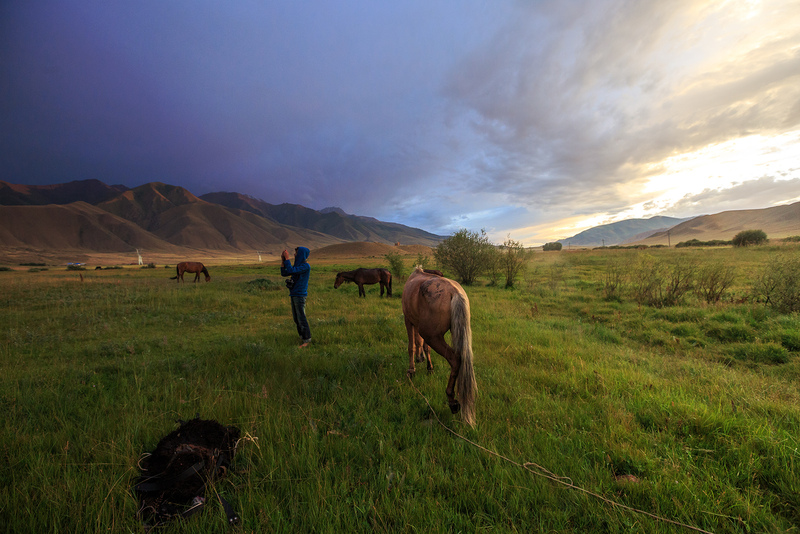 After I ended my solo adventure on horses crossing the Tien Shan in the middle of summer, I went back to Bishkek for a few days to welcome 2 young adventurers from Malaysia. 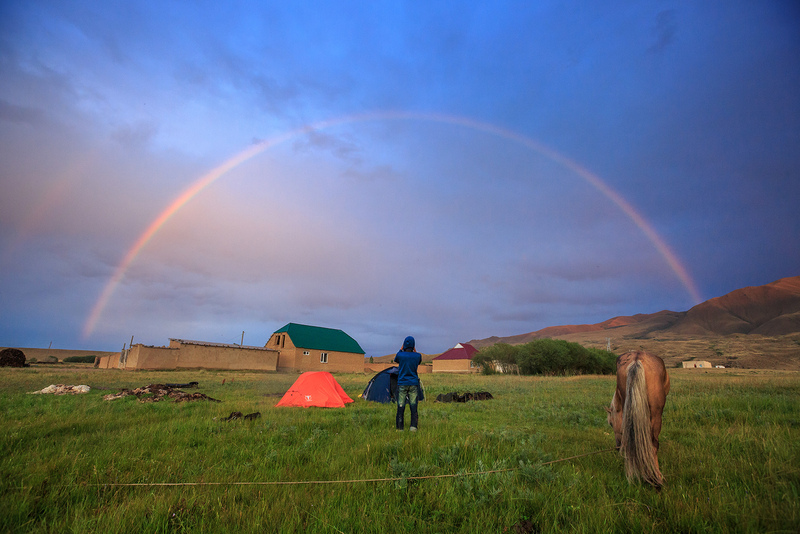 A year living in Kyrgyzstan, I became familiar with the mountains, so sometimes I became a guide for tourists from all over the world who want to explore the Kyrgyz mountains. I then had the idea to welcome tourists from my own country, Malaysia. 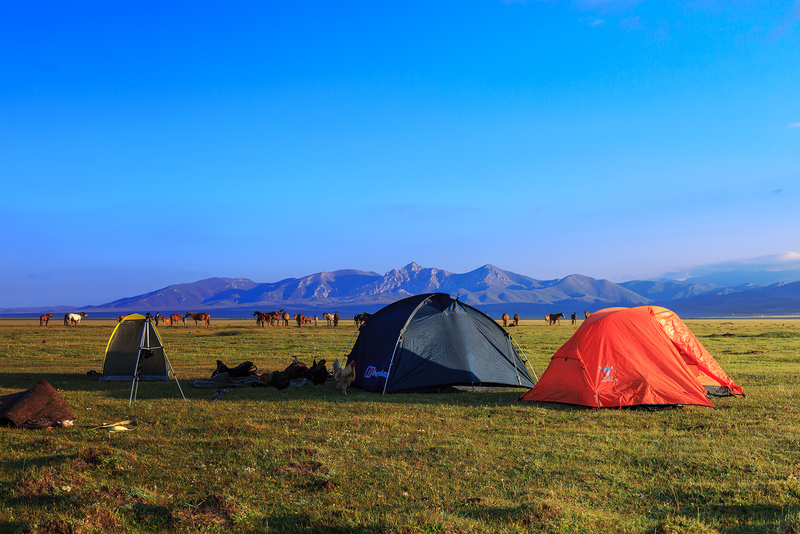 So I posted the idea on Facebook to lead a small group of Malaysians to travel on horses through the Tien Shan… travelling through valleys, following rivers, getting lost deep inside Tien Shan and wild camping near the river under the stars for multiple days. I then received 2 brave souls who took the challenge… Shazwan and Hanim, both young and adventurous. 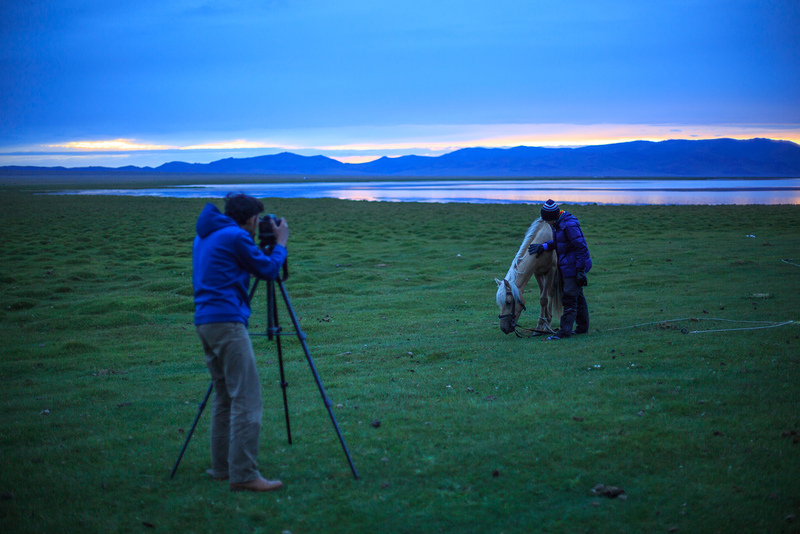 After I did a small research on their background, I confidently welcomed them to join me and my horses. I was there waited for them right after they entered Kyrgyzstan, Hanim through the Manas International Airport in Bishkek, and Shazwan through Korday border pass coming from Kazakhstan. 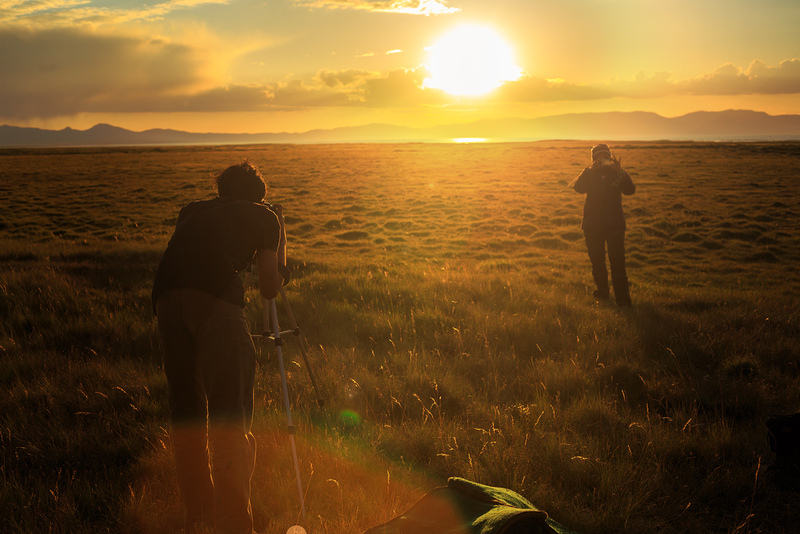 We spent a day exploring Bishkek, visiting the bazaars and get enough food supplies for 2 weeks, then we shoot straight to Songkul Lake, the starting point of our journey… early morning the next day. 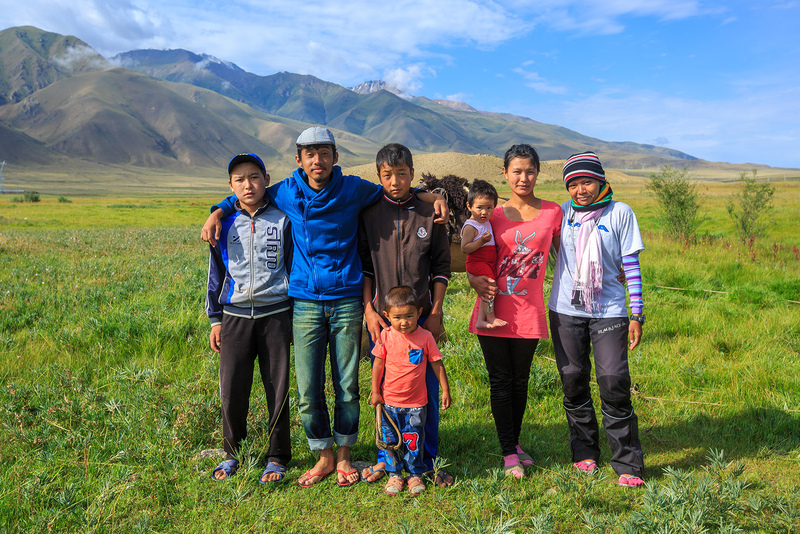 It was good to see Malaysian faces here in Tien Shan… conversing in our own language. 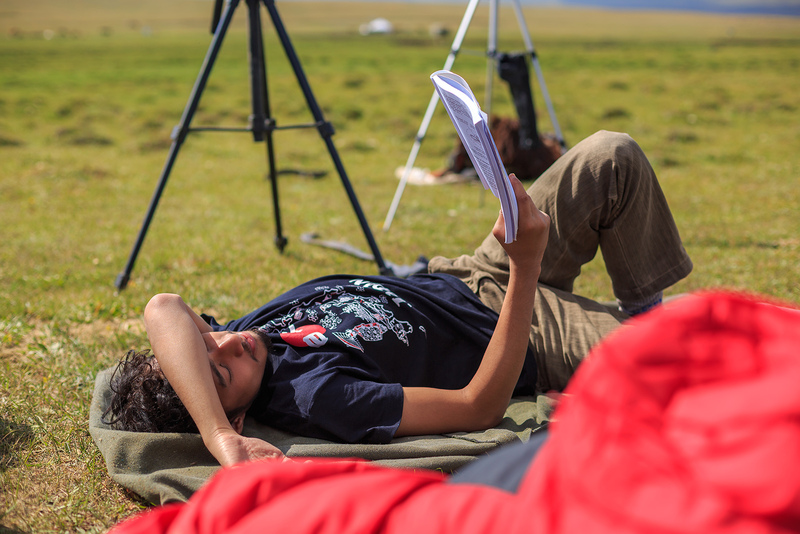 It was quite rush to take them to Songkul Lake right on the next day, sitting at over 3000m altitude from Bishkek which sits only around 800m. They started to feel dizzy at first so we took it easy. 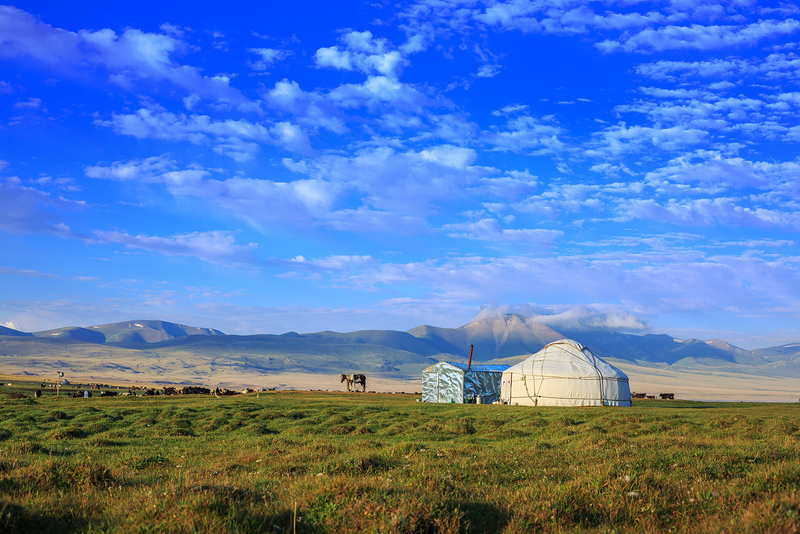 We spent the first day doing nothing except enjoying the beautiful view and stayed in a yurt to enjoy the exotic Kyrgyz cuisine. Early the next morning, I let them to try all my horses and to choose which horses they would like to ride for the journey. It was good to see that theyre both a fast learner. At first, they struggled even to get on the horseback and I was afraid to let them ride freely without me holding the rope. 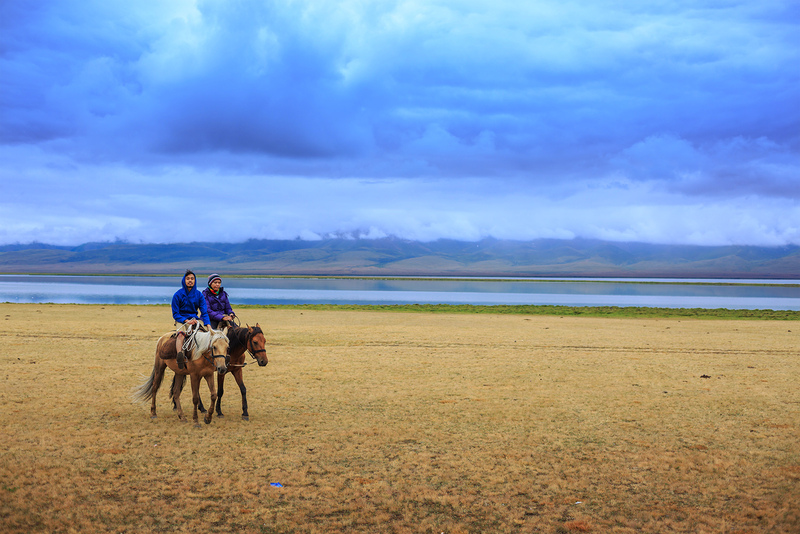 But only after 1/2 hour, they both were shouting happily, galloping fast along the Songkul lake. Watching the smiles on their faces made me happy. A few hours later, after we filled our stomach with Kyrgyz lunch in my friend’s yurt, our journey then began. As usual, I rode with 2 of my horses, one for me and one carrying the luggage, leading them along the lake. The excitement were seen on their faces since they were still fresh at the beginning of the adventure. 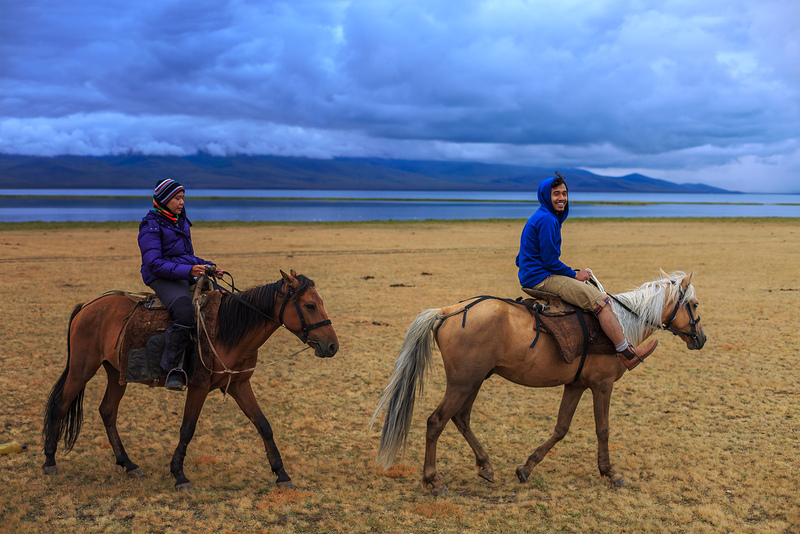 Songkul lake is huge, but riding our horses around it made us to realize that the lake is much bigger than it looks. We couldnt ride close to the shore since it was swampy so we had to ride near the hills instead, which made our journey much longer. We only rode less than 20km on the first day which put us near a sherperds yurt. 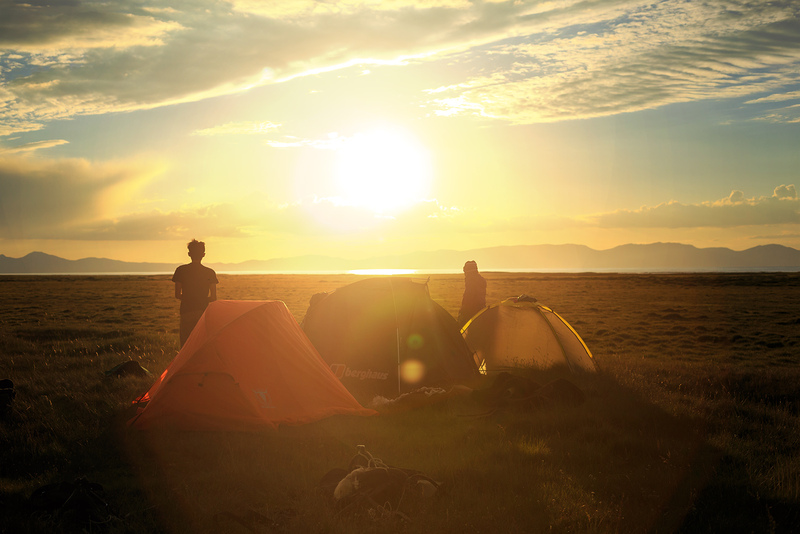 We pitched our tents nearby to sleep under the cloudy sky on the first night. I woke up in the middle of the night, around 1am and realized that one of my horses went missing. When i went closer, I found only the rope left. Since I was too tired and needed more sleep, I just ignored it and continued to sleep. The horses wont get too far anyway, there were many horses there so most probably my missing horse went to find some female horses. So the next morning, the sherperd who lived in the yurt came to help me to find my missing horse. After a few minutes, we spotted my missing horses far away with a group of other horses, about 3-4km away near the shore of the lake. After I managed to catch my horse back with the help of the sherperd, both Hanim and Shazwan finally woke up so we had breakfast together and stayed a few hours doing nothing but enjoying the surroundings, watching hundreds of horses galloping freely on the vast steppe near Songkul lake, stretching from where we stood all the way towards the far horizon and connects with the snow covered mountains of the Tien Shan, which separates the steppe with the sky. 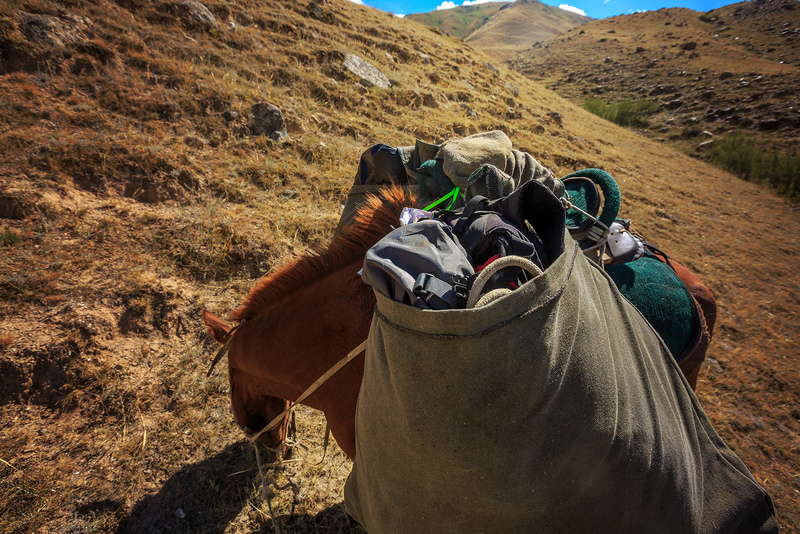 Only when the sun was high enough, we got on our horses to continue the journey. We rode slowly, it took us 4 days in total riding along the Songkul lake before heading towards a mountain pass to proceed further. We once came across Kok Boruu horse game while in Songkul. 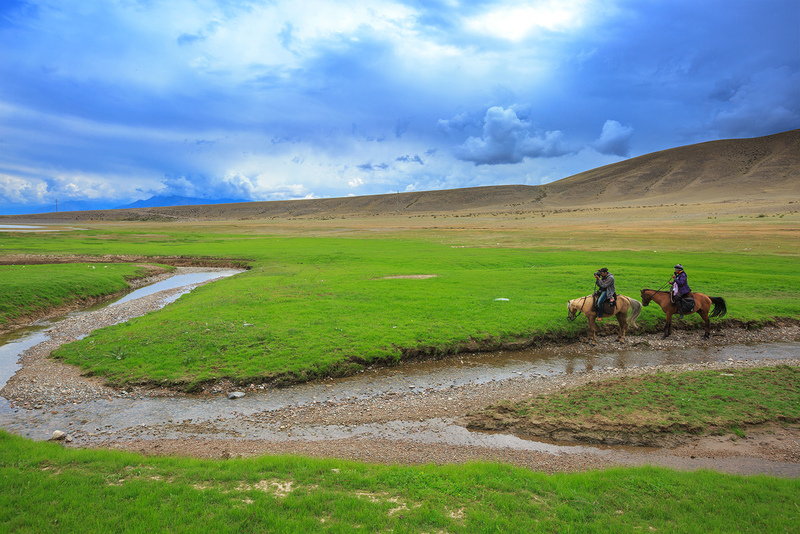 Both Hanim and Shazwan started to feel bored crossing the flat plain for days in Songkul, until we crossed the wild and steep mountain pass to get to a small village of Kizart, which was where the real excitement came in. It was steep, somewhere between 60-65 degrees and it was raining, which makes it dangerous since it was slippery as well. 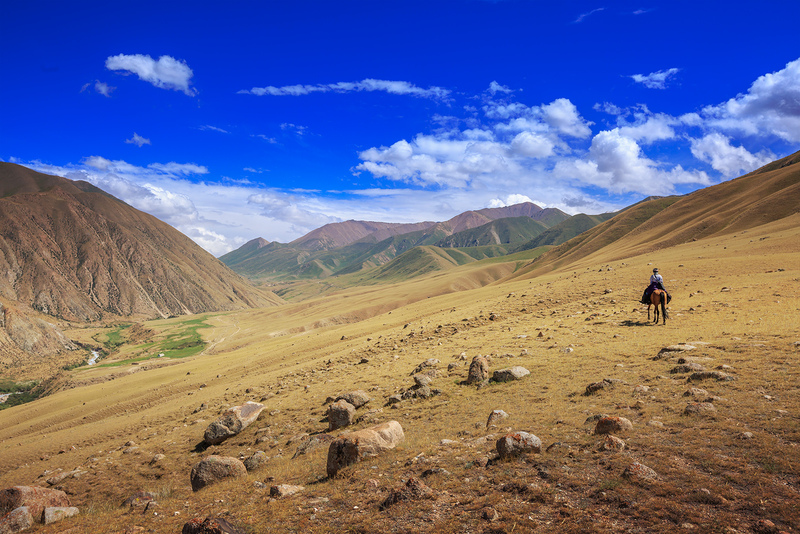 They dont have experience riding horses through steep mountains but I was confident to take them on this road since my horses are Naryn horses, a true Kyrgyz mountain breed. The climb was easy but a slow one, since the horses were tired… but the descend was scary, since it was steep and slippery. It took us about 2 hours to descend from the mountain pass before we reached a flat space to pitch our tents for the night. Once we reached our campsite, we were all excited that we managed to go through the mountain pass safely. 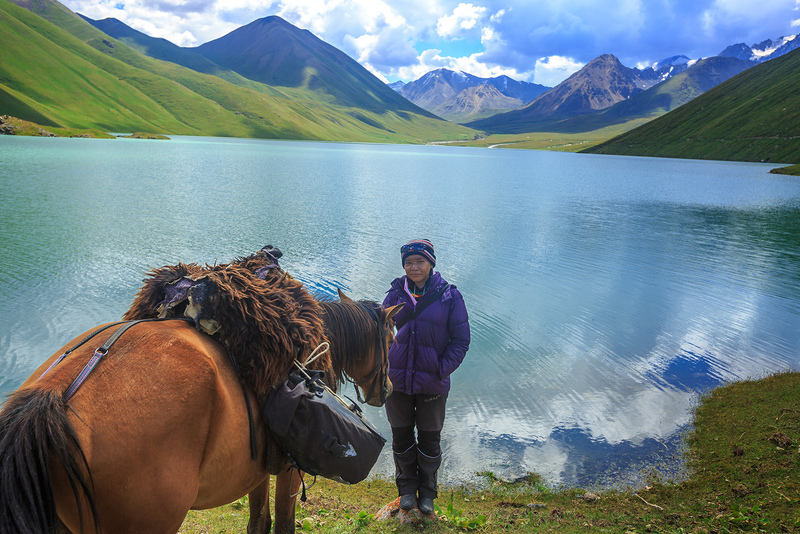 Our 9 days horse riding trip ended in another mountain lake called Kol Ukok, a less known destination for tourists which sits also around 3000m altitude. We spent a night camping near the lake before heading back to Bishkek since Hanim needed to catch a flight back to Malaysia and I spent another few more days with Shazwan doing some light trekking in southern Issykkul area. It was a good 2 weeks journey, I think I will organize more similar trips like this in the future. 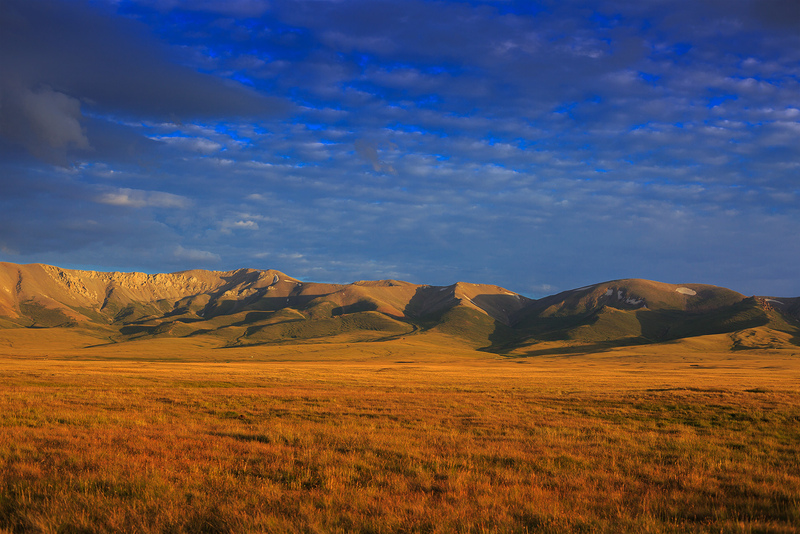 Kyrgyzstan has so much things to offer but there are not so many tourists here… this country is really a road less travelled. Here are a short video about the trip. Sorry that I dont include the English subtitles for this one, I was just lazy. Maybe you just guess what theyre saying hehe… but you can still enjoy the scenery captured here! What a wonderful trip! 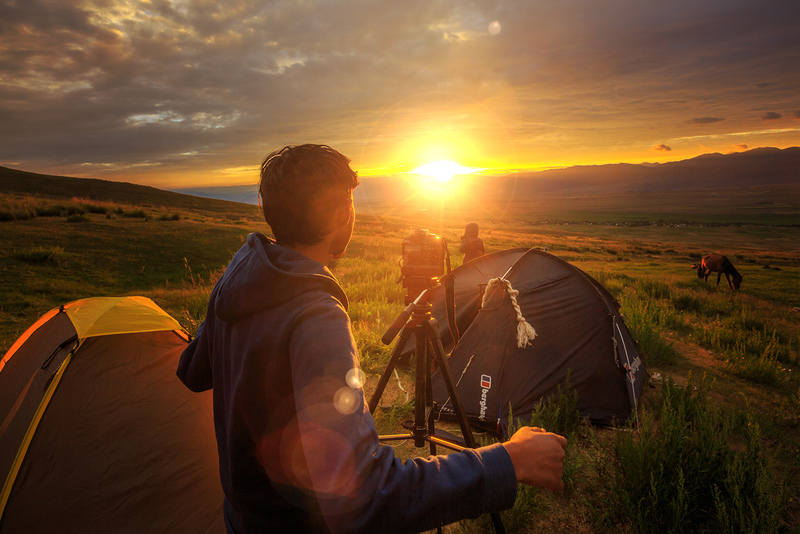 Thank you so much for the stunning photos, video and words! Keep it coming, posts from your adventures. fantastic – you have found your place it seems! Agree with Jasni Bidin…super jealous! Wah seronoknya 2 org pelancong dr malaysia tu…. pemandangan yang sgt cantik Subhanallah…. Wonderful landscapes, these photos are amazing! I love watching all of your videos ! Pingback: Sagittarius, the PathFinder! | Cerena Childress, Astrologer!